Born in Tokyo in 1929. His father was a priest of the Jodo sect of Buddhism. Admitted to the naval academy in 1945, as the war came to the end in August of the year, came back home in Hiroshima where his family had resided. His experience seeing the appalling scene of the city of Hiroshima lying in total devastation by an atomic bomb motivated him to be a designer. In 1950, he entered Tokyo University of the Arts. Made a group with his like-minded classmates, while appealed to the public "Democratization of things" and "Democratization of beauty," the group won a prize of design competitions several times. Their voluntary seminar centered by Mr. Iwataro Koike, an associate professor of the university then, named themselves as "Group of Koike." The name originated the company name GK since then. In 1957, founded GK Industrial Design Associates. In the times that society had yet no idea about design, the group appealed the meaning and the role of design through a practical project and had been gaining social confidence. They advocated their concept of design saying Dougu; "Things embodying the Way" and "The Way embodied in things" and kept probing into the idea. Their joining as a designer with the "Metabolism Movement," raised in the architectural field in Japan at that time, led them to gain a footstep in the design field of "street furniture" through the practice for "Japan World Exposition, Osaka, 1970." The practice had widened their professional field from so-called industrial design to the street furniture. Kenji Ekuan, in 1973, tried to promote the first meeting in Asia "the 8th World Industrial Design Conference" in Kyoto assembled by International Council of Societies of Industrial Design (ICSID). In 1975, he became the first Japanese president of ICSID. After the event, Kenji had been active in establishing "Japan Institute of Design," the organization proposing a solution of social problems, derived from ever complex and globalized social conditions, through the approach consolidating the ever since finely segmented design fields. Further, he appealed worldwide coordinated capacity of design fields by establishing "Design for the World" in Barcelona, Spain. On the other hand, he founded "Forum Douguology" to lead a practical study of "Idea of Dougu" derived since GK's establishment. He also proposed the plan named "Master plan for Dougu Temple and Dougu Village" to urge a new culture and civilization by consolidating all concepts and practice centered around the Idea of Dougu. To Kenji Ekuan, design is the "Way Creating Dougu" that brought man's dignity and a reason for living through things. 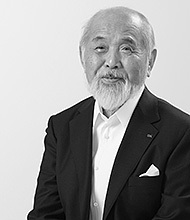 He had bet his life on building up the professional reputation of design and development of design fields not only in Japan but the world.